I know, I know, I'm super biased, but I really do mean it from the bottom of my heart. They're brave, and bold, and dream big, and are doing work in the world that is meaningful, fun, and oh so inspiring too. And they're all so wonderfully different too - after over three years now of working with almost 200 incredible creatives I see time and time again that no creative path looks the same as anyone else's. We all have different dreams, different goals, different skills, and different life experiences too. But there is something we all have in common - we all want to do work we love, live our life on our own terms, and have a whole lot of fun along the way too. 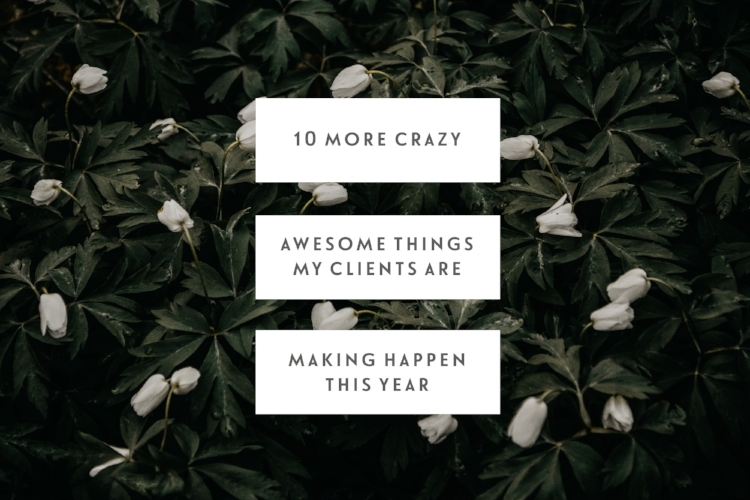 Today I want to share with you ten of my awesome clients with you and the work they're doing right now, and you can catch up with some past posts like this sharing the awesome work my clients do here, here, here, here, and here. After years of running incredible in-person retreats, Lou - the founder of Sisterhood - is now taking the community and camp online too. I've had the privilege of seeing her work on this behind the scenes from her initial idea to now launching the first online camp and I am so inspired by what she has built - the Sisterhood online camp and community is a quarterly experience that includes bespoke courses, articles, and a vibrant community for anyone who wants to dive deeper into their own wellness, business, creativity, and more. I'm a contributor for the summer camp, and Lou has brought on some incredible women as tutors for this round too. Seeing someone take a big and brave idea and turn it into a living, breathing project is one of my favourite parts of my work and I'm so excited for Lou and what's ahead for her with Sisterhood. Hannah is someone I've been working with for over a year now, and I feel very lucky to call her a friend as well as a client too. She recently launched a brand new arc to her business - wedding stationery - and I am completely in love with her work and designs. Offering custom wedding stationery design services, it's been so cool to see Hannah develop this side of her business, especially after she went full time self-employed earlier this year too. When Lizzy signed up to work together for this year I was so excited as I fell in love with her blog as soon as I saw it. Filled with beautiful words and imagery sharing moments of her life, her journey of motherhood, and her wonderful advice and insight as a writer too, Lizzy's online space is a wonderful place to escape to from all of the noise online. I'm so excited to see what this year brings for her and I feel ridiculously privileged to be able to walk with her in her journey along the way too. Lallu and I have been working together for over a year now and I've shared her work with you before, but I had to include her again today as she's been creating an incredible series over on her Instagram feed and it's been such a joy to keep up to date with it. Using the hashtag #essentialistlessons, Lallu shares should encouraging and thoughtful notes and nuggets of wisdom for anyone wanting to live and work more essentialially and joyfully along the way. Bianca creates beautiful jewellery, which she describes perfectly as everyday heirlooms, and at the very heart of her work is that idea of using your jewellery to carry your loved ones with you. I love the story and heart behind Bianca's work, and I'm oh so in awe of her skill and craft as a jeweller and silversmith too. If you're looking for the perfect keepsake piece of jewellery for yourself or as a gift for someone you love, I have a feeling you're going to love her work too. Lauren is a marketing consultant and coach who currently lives in Vancouver after moving there from the UK. After years of corporate marketing experience, she decided to leave her job so she could pursue a slower life on her own terms and has built her consultancy business for small creative businesses. It's so inspiring to see someone be brave enough to build their life and career on their own terms, and I'm so excited to see what's ahead for Lauren and the incredible work she's here to do in the world. I was lucky enough to call Olivia a friend before she became a client, and I'm a huge fan of her work too. Olivia is a photographer based in Cornwall and from the moment you see her photography I have a feeling you'll fall a little in love with it too. Olivia also has an awesome podcast, You're Not The Boss Of Me, and one of my favourite things about keeping up with Olivia's work are her Instagram Stories as she's just so open, encouraging, and insightful on there too. She's also recently launched coaching services for fellow photographers, and she has tons of awesome advice and insights over on her blog too. I was so inspired by seeing what Janet is building over at The Hills when I first had the opportunity to explore her website. An online country lifestyle magazine that celebrates everything the English countryside has to offer - through articles and a directory for businesses too - you can really feel Janet's passion behind everything she does and shares on the site, and she has some awesome contributors sharing content over there too. I'm super excited to see what's ahead for The Hills and I feel very lucky to be able to cheer Janet on every step of the way too. Joanna Yee is a photographer, the blogger behind Candids By Jo, and part of the core team over at Creating For Good too. I fell in love with her photography style as soon as I saw her work, and I love the energy and heart she brings to her work too. Originally from Boston, Jo lives in London and if you love getting lost in food and travel blogs I recommend diving into her archives as you won't be disappointed. Holly is someone I've known online for years, so I was ridiculously excited when she asked if she could hire me as her coach. I've always admired the energy, integrity, and passion that she brings to her work, and how much value she shares through her content each week too. Holly has built such an awesome and incredible business and body of work - from her monthly digital magazine, Blogging Breakthrough, to her blog coaching and digital marketing services, to the online marketing advice she shares through her blog and YouTube channel, Holly is doing so much incredible work through her business and I am so excited to see where she takes it next too. Seeing my clients be brave and bold with their work, have the courage to life their creative work and life on their own terms, and move forward and make incredible things happen is one of the greatest privileges of my life. Because so much work, and courage, and heart goes into every single business and creative endeavour that my clients bring to life. So much passion, purpose, and skill shapes the work they do in the world, and I feel so lucky to be able to walk with them in their journey along the way. I hope you've found some awesome new creatives to follow along with through this post, and that it encourages you to know that there are humans just like you out there right now showing up, doing the work, and pursuing their dreams along the way.